To use ReadyAPI, you need either a trial license or a commercial license for one of ReadyAPI tools (SoapUI, Secure, LoadUI, or ServiceV). There are several license types for ReadyAPI depending on the applications you are going to use: SoapUI, LoadUI, and ServiceV. You can purchase a license for one of the applications or a bundled license for several ones. A license for a ReadyAPI application, for instance, for ServiceV, enables all its features (including the Pro features), plus the basic features of the other applications: SoapUI, Secure, and LoadUI. Note: Secure licenses are bundled with SoapUI licenses. When you install a SoapUI you also activate Secure. Fixed licenses allow running the product by one user on one computer. They can be deactivated a limited number of times to change the computer or the user who can use ReadyAPI. Floating licenses allow multiple users to run the product on different machines, but each license can be used only by one user at a time. For detailed information on the license types, see ReadyAPI License Types. You activate licenses in the License Manager dialog. To open the dialog, select Help > License Manager from the main menu of ReadyAPI. Start Pro Trial – Activates a trial license. Buy Renewal – Opens the SmartBear shop where you can purchase the desired renewal license. Install License – Activates a new fixed or floating license. Follow the instructions in the subsequent dialog boxes. Below are links to step-by-step descriptions. You can install a renewal license after receiving it. Click Install License and specify the license. 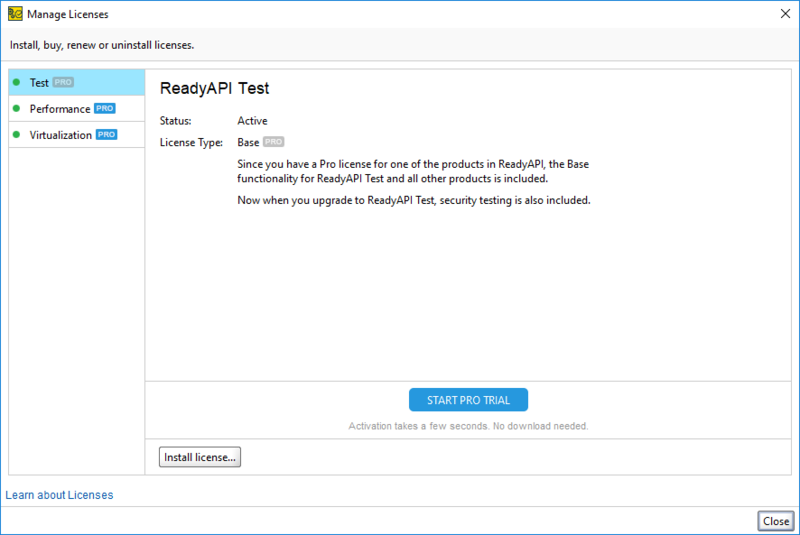 When the start date of the renewal license comes, ReadyAPI will automatically bring up the activation dialog with the same credentials as those of your previous license. If you deactivate the license, both licenses will be deactivated and exported to a single file. Note: After you activate a license, it becomes bound to your computer. You cannot activate this license again until you deactivate it. If you want to move the license to another machine, you need to first export and deactivate it on your computer, and then activate it on the desired machine. If you change the system settings (the user name, computer name, and so on), you may lose your license. To avoid this, we recommend that you deactivate the license and activate it again after you make changes.